‘The direct influence of Ancient Egyptian literature on Archaic Greece has never been fully acknowledged. Greek philosophy (in particular of the Classical Period) has -especially since the Renaissance- been understood as an excellent standard sprung out of the genius of the Greeks, the Greek miracle. Hellenocentrism was and still is a powerful view, underlining the intellectual superiority of the Greeks and hence of all cultures immediately linked with this Graeco-Roman heritage, such as (Alexandrian) Judaism, (Eastern) Christianity but also Islam (via Harran and the translators). Only recently, and thanks to the critical-historical approach, have scholars reconsidered Greek Antiquity, to discover the “other” side of the Greek spirit, with its popular Dionysian and elitist Orphic mysteries, mystical schools (Pythagoras), chorals, lyric poetric, drama, proze and tragedies. Nietzsche, who noticed the recuperation of Late Hellenism by the Renaissance and the Age of Enlightenment, simplistically divided the Greek spirit into two antagonistic tendencies : the Apollinic versus the Dionysian. For him, Apollo was a metaphor for the eternalizing ideas, for the mummification of life by concepts, good examples and a life “hereafter”, “beyond” or “out there”. Dionysius was the will to live in the present so fully & intensely as possible, experiencing the “edge” of life and making an ongoing choice for that selfsame life, without using a model that fixated existence in differentiating categories. A life here and now, immanent and this-life. And what about Judaism ? The author(s) of the Torah avoided the confrontation with the historical fact that Moses, although a Jew, was educated as an Egyptian, and identified Pharaoh with the Crocodile, who wants all things for himself. However, the Jews of the Septuagint, the Second Temple and the Sacerdotal Dynasties were thoroughly Hellenized, and they translated “ALHYM” (Elohim) as “Theos”, thereby confusing Divine bi-polarity (kept for the initiates). It is precisely this influence of Greek thought on Judaism which triggered the emergence of revolutionary sects (cf. Qumran), solitary desert hermits and spirito-social communities, seeking to restore the “original” identity of the Jewish nation, as it had been embodied under Solomon (and the first temple), and turned against the Great Sanhedrin of the temple of Jeruzalem. Ancient Egyptian civilization was so grand, imposing and strong, that its impact on the Greeks was tremendous. In order to try to understand what happened when these two cultures met, we must first sketch the situation of both parties. This will allow us to make sound correspondences. Matthews & Roemer, 2003, pp.11-12. What exactly did the Greeks incorporate when visiting Egypt ? They surely witnessed (at the earliest in ca. 570 BCE, when Naukratis became the channel through which all Greek trade was required to flow by law) the extremely wealthy Egyptian state at work and may have participated, in particular in the areas they were allowed to travel, in the popular festivals and feasts happening everywhere in Egypt (the Egyptians found good religious reasons to feast with an average of once every five days). In his Timaeus (21-23), Plato (428/427 – 348/347 BCE) testified the Egyptian priests of Sais of Pharaoh Amasis (570 – 526 BCE) saw the Greeks as young souls, children who had received language only recently and who did not keep written records of any of their venerated (oral) traditions. In the same passage of the Timaeus, Plato acknowledges the Egyptians seem to speak in myth, “although there is truth in it.” According to a story told by Diogenius Laertius (in his The Lives of the Philosophers, Book VIII), Plato bought a book from a Pythagorean called Philolaus when he visited Sicily for 40 Alexandrian Minae of silver. From it, he copied the contents of the Timaeus … The Greeks, and this is the hypothesis we are set to prove, linearized major parts of the Ancient Egyptian proto-rational mindset. Alexandrian Hermetism was a Hellenistic blend of Egyptian traditions, Jewish lore and Greek, mostly Platonic, thought. Later, the influence of Ptolemaic Alexandria on all spiritual traditions of the Mediterranean would become unmistaken. On this point, I agree with Bernal in his controversial Black Athena (1987). Bernal, 1987, p.121, my italics. Recently, Bernal has advocated a “Revised Ancient Model”. According to this, the “glory that is Greece”, the Greek Miracle, is the product of an extravagant mixture. The culture of Greece is somehow the outcome of repeated outside influence. Bernal, in O’Connor & Reid, 2003, p.29. Bernal apparently forgets that Greek recuperation is also an overtaking of ante-rationality by rationality, a leaving behind of the earlier stage of cognitive development (namely mythical, pre-rational and proto-rational thought). The Greeks had superior thought, and this “sui generis“. Hence, Greek civilization cannot be seen as the outcome of an extravagant mixture. The mixture was there because the Greeks were curious and open. They linearized the grand cultures of their day, and Egypt had been the greatest and oldest culture. Harrison, in Matthews & Roemer, 2003, p.153. On the one hand, Greek thinking successfully escaped from the contextual and practical limitations imposed by an ante-rational cognitive apparatus unable to work with an abstract concept, and hence unable to root its conceptual framework in the “zero-point”, which serves as the beginning of the normation “here and now” of all possible coordinate-axis, which all run through it (cf. transcendental logic). The mental space liberated by abstraction, discursive operations and formal laws was “rational”, and involved the symbolization of thought in formal structures (logic, grammar), coherent (if not consistent) semantics (linguistic & technical sciences) and efficient pragmatics (administration, politics, socio-economics, rhetorics). Because of the Greek miracle of abstraction, rationality and ante-rationality were distinguished, equating the latter with the “barbaric” (i.e. 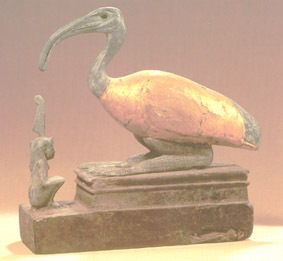 coming from “outside” Greece and its colonies) or seeking the inner meaning of Egyptian religion (i.e. the wise men who studied in Egypt and later the infiltration of Greeks in the administrative, scribal class). Although the inner sanctum of the temples of Ptah, Re and Amun must have remained closed (excepts perhaps for exceptional Greeks like Pythagoras), the Greeks adapted to and rapidly assimilated Egyptian culture and its environment. La’ada, in Matthews & Roemer, 2003, p.158. On the other hand, the Greeks had no written traditions and so no extensive treasurehouse of ante-rational, efficient knowledge (no logs). They had no libraries like the Egyptians. In their Dark Age, literacy had dropped dramatically and only in Ionia and Athens could pieces of Mycenæan culture be detected. The old language (Linear B) was lost. At the beginning of the so-called Archaic Period (starting ca.700 BCE), the Greeks could not erect temples, had a new alphabet adapted from the Phoenicians, no literature and very likely an oral culture, containing legends, stories about the deities and grand, heroic deeds (such as recorded by Homer & Hesiod, ca.750 BCE). When their abstracting, eager and young minds got in touch with the age old cultural activity of the Egyptians, the encounter was very fertile, enabling the Greeks to develop their own intellectual & technological skills, and move beyond the various examples of Egyptian ingenuity. They were able to deduce abstract “laws” (major), allowing for connections to be made beyond the borders of context and action (minor) and the application of the general to the particular (conclusion). Moreover, the rich cosmogonies of Egyptian myth, the transcendent qualities of Pharaoh, the moral depth of Egypt’s sapiental discourses and the importance of verbalization in the Memphite and Hermopolitan schools were readapted and incorporated into Greek philosophy, as so many other connotations and themes, adapted by their Greek authors to their Helladic taste.